In this review we feature the best Hi-Fi systems that provide superb stereo sound performance with digital audio processing. These Hi-Fi systems are built to deliver immersive sound for music listening in your home while creating a good soundstage. Furthermore, these Hi-Fi systems come with multiple input options and support CD, USB, auxiliary and wireless Bluetooth streaming. The speakers in the system are tuned to deliver crisp highs, detailed midranges and good bass response, so you can enjoy your movies and music all day with crystal clear accuracy. Our experts have tested numerous Hi-Fi systems to determine which ones deliver the best value for money, so be sure to check out our top picks below! The Onkyo CS-265(B) is one of the best Hi-Fi systems capable of playing a multitude of different formats, enabling users to combine their physical CD collection with modern digital streaming services. The system produces powerful sound with a power of 20 Watts per channel and renders high quality audio. The speakers are comprised of a woofer and a tweeter, the crossover frequency between the two being at 4.5 kHz. 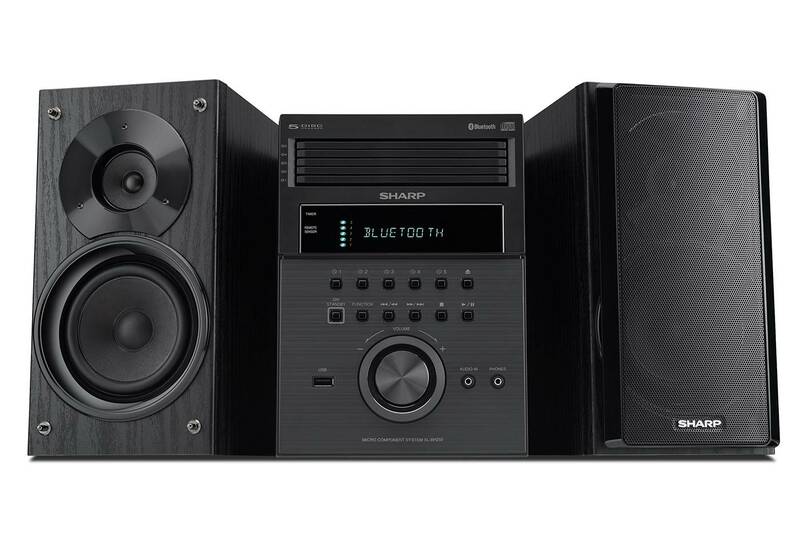 This Hi-Fi system is equipped with full digital audio processing capabilities and an efficient digital amplifier, fine-tuning the system to create a clear and balanced stereo sound. 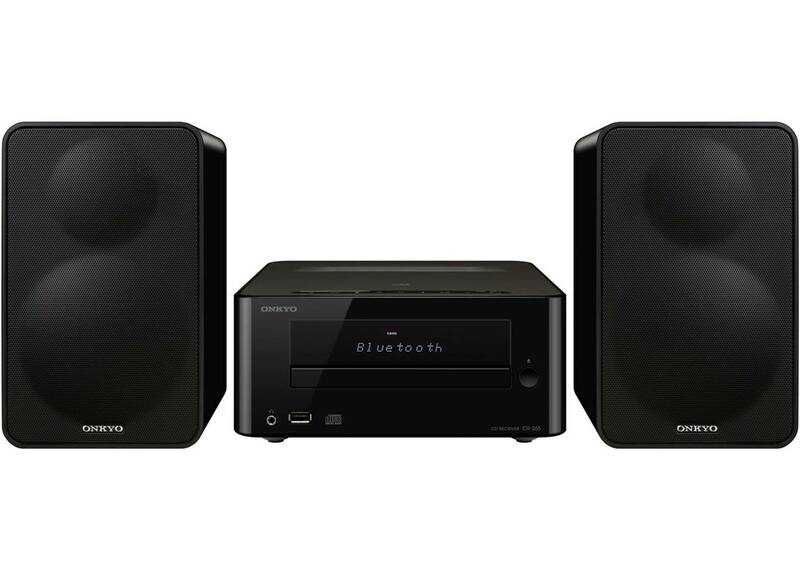 They Onkyo CS-265 can connect wirelessly to streaming devices by using the efficient Bluetooth 4.0 technology which creates a reliable connection. The digital transmission medium poses no signal quality loss or delay. It is also NFC compatible, connecting to streaming devices with a simple touch. 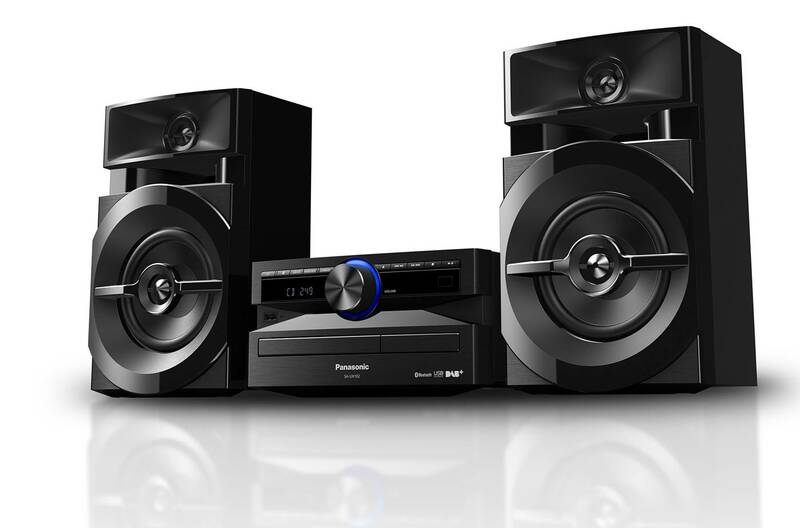 In addition, the CS-265 Hi-Fi system can also play audio CD, CD-R, CD-RW and mp3- encoded CDs. It also has a USB port for devices and memory disks, as well as 3.5mm TRS jack socket for an analogue sound source. It can toggle between two modes which enhances the bass frequencies or leaves the sound unaltered. The Panasonic SC-UX100 has been designed to be space efficient while maintaining all the qualities of a larger stereo system. It is one of the best Hi-Fi systems capable of powerful bass and a clear room-filling sound despite its unimposing size. It houses an impressive 300 watts of power for the 13cm woofer and 5 cm tweeter setups. The speakers have a 2-way design which helps the system emit wider, more expansive sound. The SC-UX100 has a modern and stylish design which can visually fit in any kind of room. The processing unit has a built-in equalizer which has a number of presets which will enhance your music depending on your taste. It also provides a manual 3-band equalizer offering users control over the bass, mids and treble, which is perfect for adjusting the system to compensate for the boominess of a room or lack of high-end for older recordings. This Hi-Fi system can support a multitude of audio formats. It can connect wirelessly to any digital streaming devices using a Bluetooth connection, allowing users to play through anything from their digital library. It also has a CD input which supports normal CDs and mp3-encoded CDs. The SC-UX100 also has a USB input for connecting devices through a wire or playback from a USB storage device. We liked the fact that this system comes with a local preset equalizer that allows you to choose from preset modes including rock, pop and more according to your music preferences. 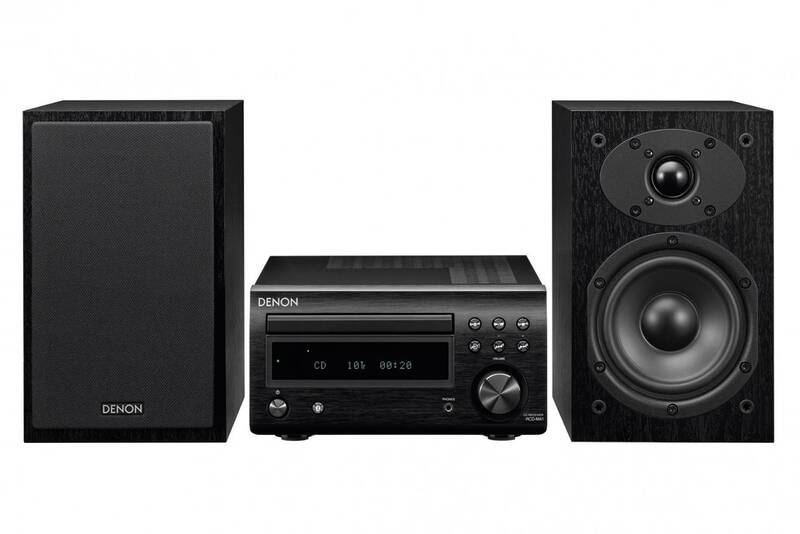 The Denon D-M41 is a stereo CD player and FM receiver speaker system which produces high quality sound suitable for small to medium sized rooms. The SC-M41 bookshelf speakers have 30 watts of output power each, a high quality 4 3/4″ woofer and a 1″ high definition silk dome tweeter. It’s one of the best Hi-Fi systems that provide excellent stereo sound performance and powerful sound without any distortion at high volume levels. The system can render a smooth, natural and powerful sound which is enhanced by the triple noise reduction system – it preserves signal purity and eliminates distortions from three noise sources, providing a more dramatic home theater experience. The emphasis on low-noise signal makes this system an excellent choice as a home theatre setup. In addition, the Denon D-M41 can connect wirelessly with any Bluetooth-enabled device, allowing users to stream their digital library of music at a high quality. The control unit features a 3.5 mm jack output for headphones suitable for those who want to listen to their CD collection without disturbing any other present person. The Hi-Fi system has a classic design which can fit in any kind of room without attracting attention from a visual point of view. The system can be controlled using the provided remote for convenient interaction. The Toshiba TY-ASW91 Micro Component Speaker System has been designed to provide powerful, high quality audio while being small and convenient to transport and store. It’s one of the best Hi-Fi systems that produce high-fidelity sounds using 2 cabinet speakers with a power output of 15 watts each and comprised of a woofer and tweeter in order to create a good balance between bass and treble. We liked the design of the Toshiba TY-ASW91 Hi-Fi system – it has a really sleek appearance and blends in nicely with modern home interior décor. The main console system has a minimalist design and can hit onto bookshelves without occupying too much space. The system is compatible with multiple types of media, both digital and analogue. It can connect wirelessly to any Bluetooth enabled device, allowing user to stream directly to the speakers their digital music library. The connection is reliable and poses no audio degradation or latency. 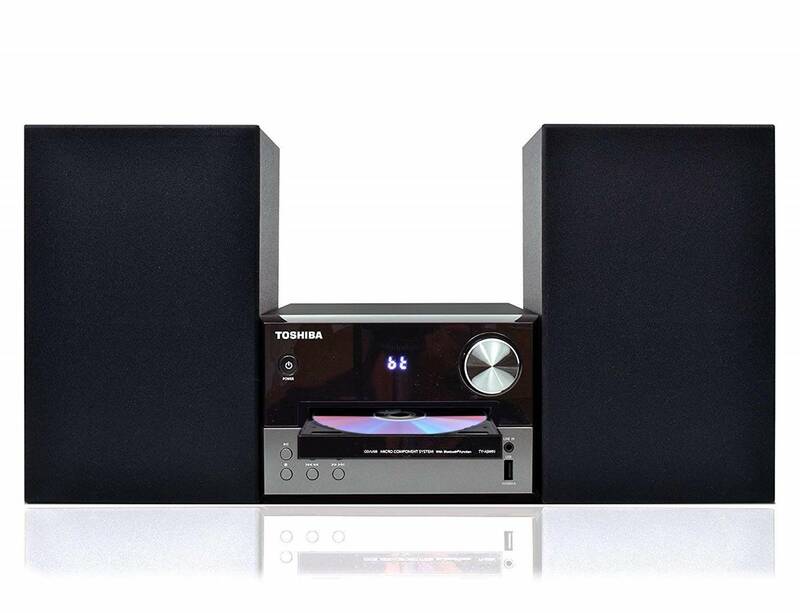 The Toshiba TY-ASW91 can also play music and mp3-encoded CDs. It can take in an analogue sound source using the aux in 3.5mm jack socket, or play music from a storage device using the USB socket. The TY-ASW91 can also tune in to FM radio whenever needed. While the system is small in size, it has great functionalities and the speakers are able to output sound powerful enough to comfortably fill small to medium sized rooms. The Sharp XLHF102B is a Hi-Fi stereo system capable of producing high quality sound from a multitude of different media forms, both digital and analogue. It has a stereo set of 2-way speakers which have extended sound propagation capabilities, offering a total of 50 watts of output power which is enough to fill a small to medium sized rooms. The speakers are comprised of a woofer and a tweeter which allows for a good balance between the bass and treble. If needed, the control unit has a bass boost option for those who add additional weight to their music. The XLHF102B can connect wirelessly to any Bluetooth-enabled device, allowing users to stream their digital music library directly to the speakers at any time, without any transmission-related signal quality loss. In addition, the Sharp Hi-Fi system has a USB port that allows playback from storage devices. The built-in CD players can read both music CDs and mp3-encoded CDs so that whole libraries can be used without compatibility issues. If desired, the hi-fi system can also tune into AM and FM radio and it can be controlled using the included remote. The Onkyo CS-N575 is a Hi-Fi CD system with multiple functionalities that can render high quality sound using stereo speakers. The receiver pairs with 2 D-075 bookshelf speakers which have a 2-way design that allows for wider sound projection. The speakers have a woofer and tweeter which handle the low and high end respectively, creating a good balance between the bass and treble outputs. The N575 is one of the best Hi-Fi systems that can handle traditional music playback mechanisms such as CDs, USBs, FM radio and can also take in external analogue and digital sound sources. The distinguishable features of this system are the Wi-Fi and Chromecast compatibilities which offer unprecedented flexibility in terms of digital music streaming and connectivity. The dual-band Wi-Fi and built-in streaming service include Spotify, Pandora, Tidal and Deezer, which are the main digital music platforms available at the moment. The CS-N585 can also be made part of a multi room audio setup using Chromecast built-in, DTS Play-Fi or Fire connect. 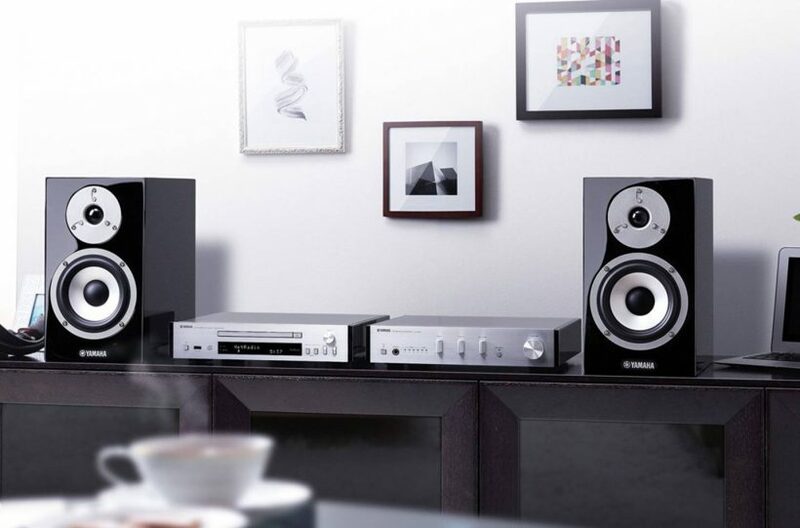 The Onkyo system has a classic black design which can fit in any kind of room without having a visual impact. The large LCD screen provides easy menu navigation and setup. 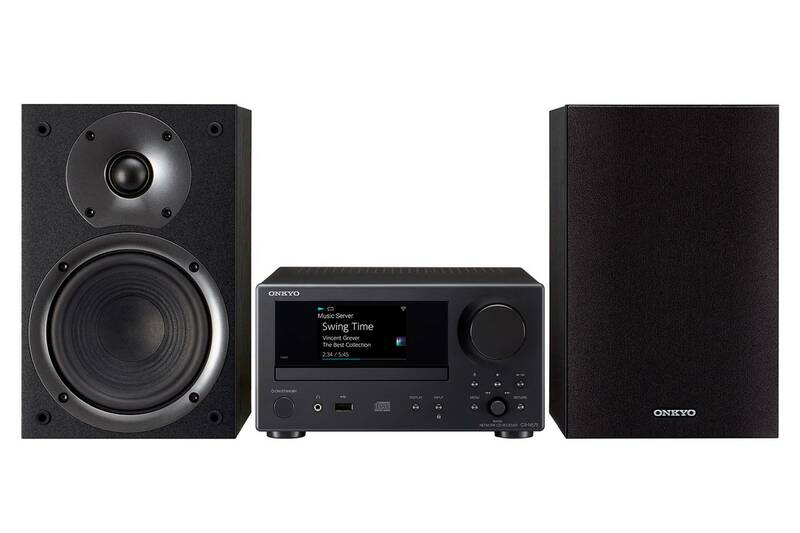 If you are looking for one of the best Hi-Fi systems that specifically supports dual-band Wi-Fi and has built-in streaming services including Spotify, Pandora and Deezer, the Onkyo CS-N575 is a great choice. 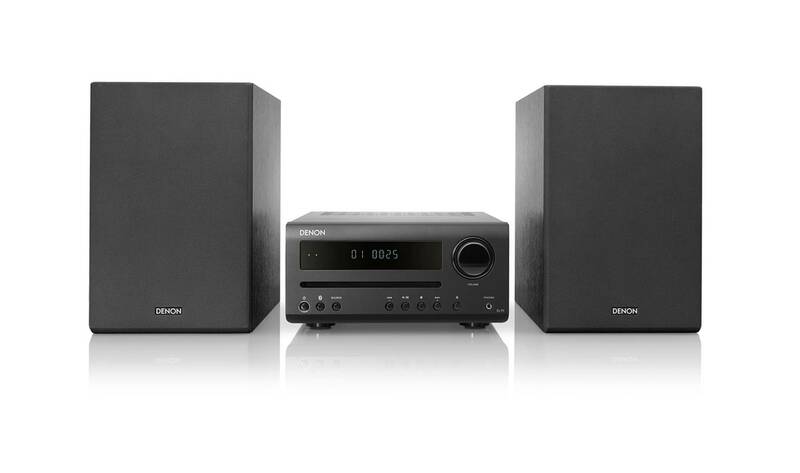 The Denon D-T1 Hi-Fi mini system has been designed with simplicity in mind in order to allow users to output high quality audio without the need for complex setups. The 2-ways speakers propagate sound at wider angles which enables them to fill out rooms with sound more easily. They feature a 12cm woofer and 2.5cm soft dome tweeter, handling the bass and treble respectively for a balanced output. The D-T1 can connect wirelessly to any Bluetooth enabled device, allowing users to easily stream their digital music library through the stereo system. The wireless connection is reliable and poses no transmission-related signal degradation. In addition the Hi-Fi system is also compatible with music CDs, mp3-encoded CDs, and it can also tune in to AM and FM radio. The integrated headphone jack gives users the option of listening to CDs through headphones and bypassing the speakers for a private listening experience. The control unit has one optical input which is used to connect televisions or home cinema systems. The D-T1 has a modern and simple design which can make them seamlessly integrate in any kind of room without having a negative visual impact. Overall, the D-T1 is one of the best Hi-Fi systems that provides really good sound performance with its 2-way speaker design and comes highly recommended for compact setups. 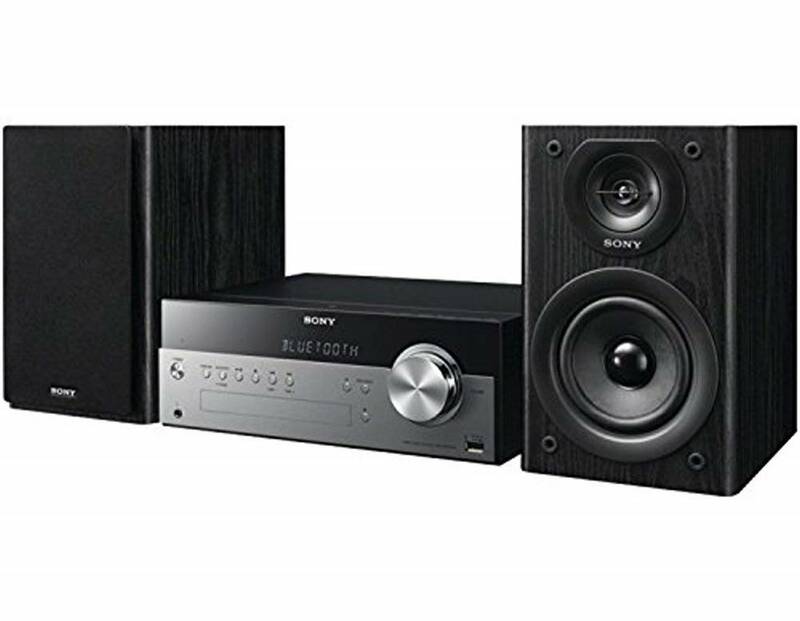 The Sony Micro Hi-Fi system is a compact system with extensive functionality and high quality sound rendering capabilities. It features two bookshelf speakers which pack a total of 50 watts RMS total power due to the S-Master amplifier circuitry. The speakers have a 2-way design which increases the sound propagation angles and make it possible for them to fill up a small to medium sized room. The Sony Micro is one of the best Hi-Fi system featuring bass reflex capability which ensures a consistent level of bass throughout different songs, creating a sense of continuity and consistency. The system can be wirelessly connected to any kind of Bluetooth-enabled device, establishing a reliable, high-quality connection which enables users to stream their digital music libraries straight to the Hi-Fi system. In addition, the Sony Micro is compatible with music and mp3 CDs, it can tune into both AM and FM radio, it has a USB socket for playback from storage devices and it can receive an analogue input from an auxiliary source. It is compact and sleek, fitting perfectly in any kind of room and being easily transported and stored. The LCD screen displays essential information and allows for easy navigation. 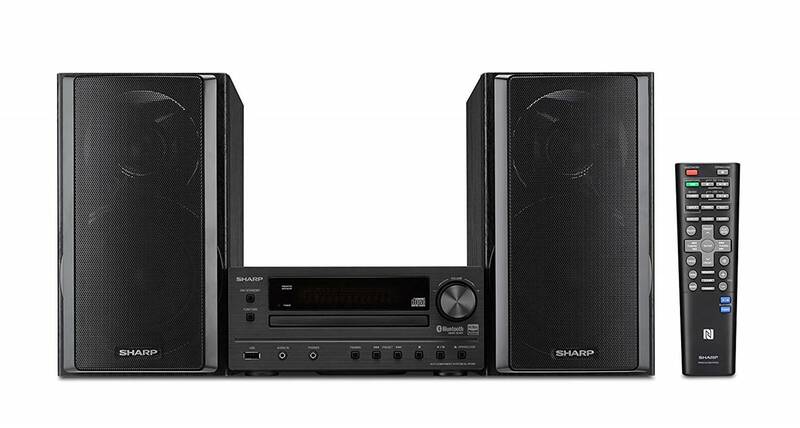 The Sharp XL-BH250 is a stereo speaker system which can play audio from various sources at a high sound quality. It has two bookshelf speaker which feature a woofer and a tweeter that handle the low end and high end of the frequency spectrum respectively. The system can connect wirelessly through Bluetooth with most modern devices, setting up a reliable, high-quality connection which enables users to stream their digital music libraries at any point. In addition, the XL-BH250 works with all types of music CDs and it can store up to 5 discs and switch between them quickly. The main transceiver can tune in t both AM and FM radio and can have external devices connected through a USB port or digital optical input. The Sharp Xl-BH250 has a modern design in all-black that can easily integrate in any kind of room without standing out from a visual perspective. The system comes with a remote control which adds an additional layer of convenience, enabling users to control the system from a distance. The remote control is a great addition especially when using the Bluetooth connectivity function. Overall, the Sharp XL-BH250 is one of the best Hi-Fi systems you can find on a budget and we highly recommend them. The Swans M200MKIII is a set of stereo speakers which produce high quality sound and one of the best Hi-Fi systems you can find that delivered a balanced sound signature. The speakers have an impressive total output of 120 watts RMS and are able to render instruments very well within the stereo space. They feature a long-throw 5.25” woofer which provides powerful bass and a 1.1” coaxial tweeter which render accurate details of instruments and vocals. The speakers have a 2-way system which enables the speakers to produce sound at a wide angle. They can connect wirelessly to any kind of Bluetooth enabled device, establishing a reliable and well-performing transmission channel. 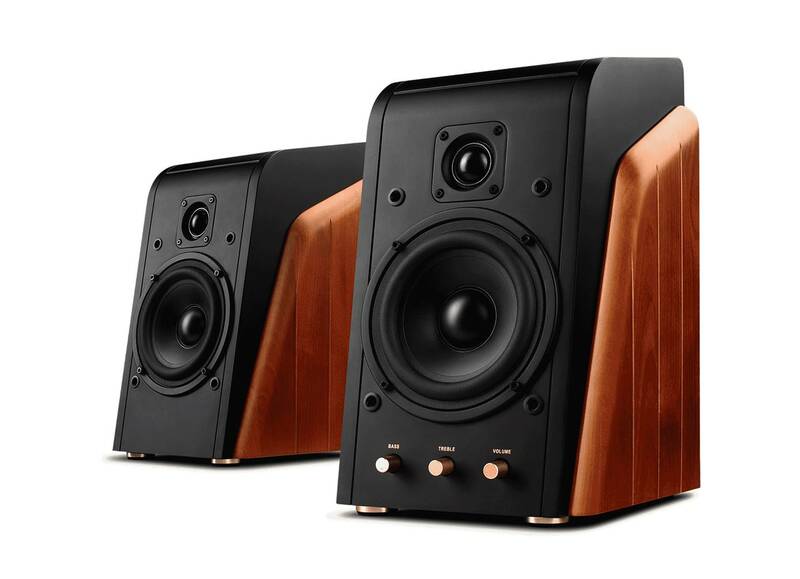 They have a luxurious design with a cherry wood enclosure which adds warmth, creating a more natural sound. They are relatively small and can be easily implemented into a desktop setup or a home theatre setting. The M200MKIII offer a wide variety of controls, giving the user the ability to change the bass and treble volumes in report to each other. The system comes with a remote which allows for wireless control of the volume, equalizer and playback options.